President Bush's Democratic critics have accused him of leaving the US isolated and worse off. House of Representatives Democrat leader Nancy Pelosi said resources had been stolen from education and health to pay for the Iraq campaign. 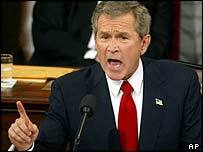 Candidates for the party's presidential nomination went on the attack after Mr Bush's State of the Union speech. President Bush insisted that his foreign policies had made Americans - and the world - safer. The State of the Union speech, the fourth of his presidency, is being seen as Mr Bush setting out his case for re-election in November, before a challenger emerges. "America this evening is a nation called to great responsibilities. And we are rising to meet them," Mr Bush told a joint session of Congress watched on television by millions of Americans. The BBC's David Bamford says that many Republicans have described the president's performance as effective and robust, but it will do little to unite the nation around a common purpose. Ms Pelosi, in the Democrats' official reply to his speech, said Mr Bush had led the US into war in Iraq based on unproven assertions, and incurred huge costs now being met by American taxpayers. "He has pursued a go-it-alone foreign policy that leaves us isolated abroad and that steals the resources we need for education and health care here at home," she said. "America must be a light to the world, not just a missile," she added. Wesley Clark, a leading presidential hopeful, compared the administration to the Axis of Evil, a phrase Mr Bush coined himself in a previous address to describe states threatening the US. "It's an axis of fiscal policies that threaten our future... foreign policies that threaten our security... and domestic policies that put families dead last," he said in a statement. Senator John Kerry meanwhile, fresh from a surprise victory in Monday's Iowa Democratic caucus, accused Mr Bush of doing nothing while the US lost more jobs than at any time since the Great Depression in 1929. Mr Bush focused on the war on terrorism he launched following the attacks on New York and Washington, saying it was far from over. Mr Bush also emphasised his domestic agenda, with an upbeat assessment of the strength of the US economy. Much of his speech focused on policies such as trying to improve school standards, extending access to prescription drugs for senior citizens, and immigration reform. "Much of the President's speech was about domestic issues"